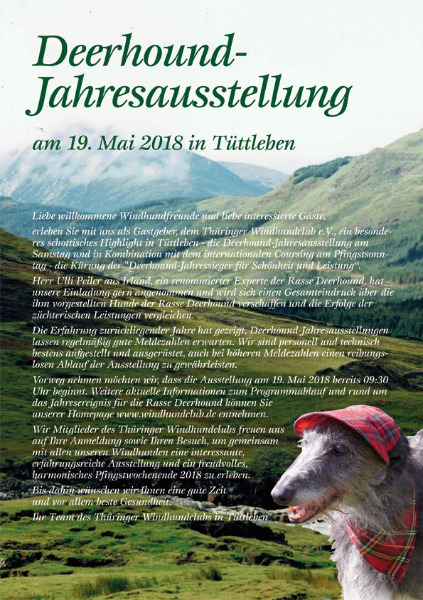 The Deerhound Jahresausstellung (German Breed Show) is an 19/ May/ 2018 in Tüttleben. Good luck and fun for all. Titel: Dt. Jug.-Ch. (DWZRV); Jub.Sg. 125 Jahre DWZRV; LS NRW(2017); LS Rheinl. (2017); Ned. Maiden Islay´s | CMKU D/265/-16/16 | 07.01.2016 Titel: CZ Ch. Grayrory´s Glorious | SE 13618/2014 | 20.12.2013 Titel: Fin., Swed. Ch. ; C.I.B. Last Edit: 10 months 3 weeks ago by Joerg Yoki.